133 Quayside Drive Jupiter, Fl 33477 has been sold. THIS CUSTOM WATERFRONT ESTATE HOME IS TRULY A GEM. WITH OVER 180' OF WATER FRONTAGE ALL WITHIN MINUTES TO THE INTRACOASTAL, THE VIEWS ARE SPECTACULAR. INTERIOR IS NEWLY PAINTED, BUILT-INS ADDED... YOU CAN STOP LOOKING FOR A HOME. THIS HOME WILL NOT LAST AND IT HAS SOMETHING FOR EVERYONE. 4 BEDROOMS ALL WITH PRIVATE FULL BATHS, 1ST FLOOR MASTER BEDROOM, OFFICE, ENORMOUS CLUB ROOM WITH FULL SERVICE WET BAR, LARGE SCREEN FOR VIEWING, AND A WRAPAROUND BALCONY, LARGE MOTOR COURT, CUL-DE-SAC LOCATION, LIGHT AND BRIGHT KITCHEN AND FAMILY ROOM ALL WITH VIEWS OF THE POOL, PATIO AND WATERWAYS ARE A FEW OF THIS HOMES TREASURES. 133 Quayside Drive located in Jupiter, FL is a single family home with 4 bedrooms, 5 full baths and 2 half baths.The Home at 133 Quayside Drive was built in 2009 in Admirals Cove and offers a 4 car garage. This Admirals Cove Home offers pool, golf course, boating, tennis, clubhouse, exercise room, game room, spa-hot tub, putting green, street lights. 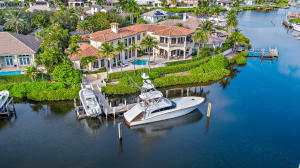 133 Quayside Drive Jupiter, Fl is currently listed for $4,750,000 under the MLS# RX-10482588. This Home has been put on the Jupiter MLS system and currently has a status of SLD. Admirals Cove in Jupiter is really a wonderful community in a great city. If you like the beautiful Jupiter location but you are not sure about this community. You might like one of the other local communities like Ocean Club or Bluffs Ocean South or Pennock Point or Mystic Cove or Sims Cay that are located here.